WhisperPhone® Duet by HAREBRAIN INC.
Other products from HAREBRAIN INC.
WhisperPhone Duet uses the power of auditory learning while also allowing students to learn together in pairs. Duet also can keep classrooms quieter. Duet is Title I and Reading First funds qualified, dishwasher safe and battery free. It received a 2009 Dr. Toy’s Best Vacation Products award. Launch date: May 2009. With this ready-to-use pocket chart, children are able to apply word-study skills to a shared reading text, engaging in shared reading with an instructional purpose. The activities target punctuation, letter combinations, letter patterns and word endings. It includes a pocket chart and 84 printed cards. Launch date: 2009. Early Learning Center Colors & Shapes by PATCH PRODUCTS INC.
Other products from PATCH PRODUCTS INC. The Early Learning Center Colors & Shapes kit is made to challenge kids in a fun and colorful format. Kids can learn to identify shapes and colors by completing tasks, to sort using more than one attribute, to recognize shapes and colors of objects in their environment, and to develop grouping and classifying skills through game play. "Children especially love the color and shape bingo, combining shapes and colors and the picture search activity mats," Jessica Wineke, PR coordinator for Patch Products, told TDmonthly. Launch date: 2009. H-racer 2.0 (IR control) by HORIZON FUEL CELL TECHNOLOGIES PTE. LTD.
Other products from HORIZON FUEL CELL TECHNOLOGIES PTE. LTD. Horizon's iconic H-racer refuelable fuel cell car has entered the second generation, with infrared remote control and steering capability, as well as faster driving speed due to a new generation of miniature PEM fuel cell. Launch date: October 2008. Over & Under the Sea™ Mat by LEARNING RESOURCES INC. Kids can splash into undersea adventures with friendly creatures that engage them in early learning games. It includes a treasure hunt and plays eight children’s songs. They press the gem notes to create original tunes. The mat is designed to keep kids on the move with floor play, or for play on a table. It features high-quality audio, automatic shut-off, adjustable volume and Activity Guide. It wipes clean and is for one to three players. The mat measures 34” L x 30” H and requires 4 AA batteries, not included. Launch date: May 20, 2009. Built in 3-D, the collectible, space-age ant colony modules and connecting tubes are made in daylight and night colors for a cool look. Each sphere features three lenses to easily observe the ants: one clear, one that magnifies and one fisheye. "The Wild Science kits are constructed of the highest quality materials and designed for extended play use. Each individual kit can be designed, customized and modified to an individual child’s liking," Vickie Cullen, PR account executive for International Playthings, told TDmonthly. Launch date: June 2009. The myPC Stage I Keyboard is a personalized computer keyboard designed especially for toddlers' learning styles and lifestyles. "Unique features include large, rubberized keys and a tough spill-proof exterior," Elizabeth Tarpley, CEO of Targeted Technology Solutions, told TDmonthly. It received a 2008 Toy Man Award of Excellence and Seal of Approval. Launch date: September 2009. Each players pits his dinosaur against an opponent’s in this deck-dueling challenge, while watching out for Dino Danger. 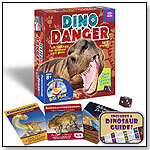 Players can learn about dinosaurs and their world in this prehistoric card game featuring action elements and a dino die to change up game play. It also comes with a dinosaur pocket guide. "Children will learn dinosaur taxonomy and time periods long before they even realize they’ve been learning!" Geoffrey Moran, president of Evolving Toys, told TDmonthly. Launch date: August 15, 2009. Boarding Basics DVD by GarageCo Toys, Inc.
Other products from GarageCo Toys, Inc.
"Boarding Basics" is designed as the perfect companion DVD for the award-winning Yo Baby Kick Flipper. The easy to follow DVD offers instruction on tricks such as the 180 and 360 Spin, Ollie, Peanut Flip, Caveman and lots more. It takes kids through each move, step by step, so they can follow along and learn. "It is the only step-by-step DVD that teaches kids how to do all the cool boarding tricks on a Yo Baby Kick Flipper (think 'skateboard without wheels') in the safety of their home," Bob Ellis, president of GarageCo Toys, told TDmonthly. Launch date: July 21, 2009. This Solar Motor is ready to go right out of the package. Designed for demonstrating the principles of solar power, this kit includes a 1.1-volt, 75mA high-quality solar panel, propeller, and a state-of-the-art coreless DC motor capable of up to 22,000 rpm. This Solar Motor is a good way for introducing alternative energy concepts or just having fun outside while the sun is shining. Launch date: 2009. Nelly Dragon is a 10" plush educational pal. She includes 1/2 life-size dentition with four flossible locations, bendable extremities to hold toothbrushes. The product includes two children's toothbrushes and one plush toothbrush, designed to serve as a great way to teach the proper way to bruch and floss. Launch date: 2009. Multi-Sensory learning perfect for typical and special needs. This fun and engaging card set lets your child feel the different textures of the Horse and Lizard, smell the distinctive aromas of Apples and Roses, and much, much more! Learn the entire alphabet and many beginning words in Sign Language and Braille. KinderCone’s namesake product is a large, colorful cone filled with inspiring and educational gifts for young children, which parents give to their children to recognize the transition from kindergarten to first grade. KinderCone’s guiding principle is about inspiring young children to enjoy learning by celebrating this special milestone in their lives. KinderCones are 28" tall, handmade in Germany of sturdy box-board printed paper, and feature a limited edition design. Each KinderCone comes pre-filled with a Kinderjournal, Kalri, the plush main character of the journal, five pencils and temporary tattoos. The cones are offered in two main colors, red and bright green, and offer eight color options of the felt enclosure on top. "KinderCone is the first and only American company to re-create this concept outside of Europe," Vivian Lie, owner of KinderCone LLC, told TDmonthly. Launch date: July 15, 2009. From the "It's Our Planet" series, this DVD is designed for kids to learn about the animals, people and plants that call this region home. They can discover what a rainforest needs to survive, and how this beautiful natural resource is disappearing. In collaboration with rainforest conservation organizations, One Smart Cookie has compiled an educational and informative DVD that uses imagery and video. 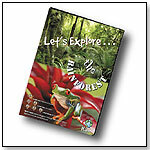 "The DVDs in the 'Let's Explore' series and in the 'It's Our Planet' series use a multi-level format to cover background knowledge, as well as appealing to a wide age group (pre-K through age 10). Multi-level learning (or differentiation of instruction) is a critical factor in our children's education. Being able to move at their own pace allows your child to feel a sense of pride as they complete a level and move onto the next. Each level in the 'Let's Explore' series expands on the teachings of the previous level, adding more facts, vocabulary and scientific knowledge," Keli M. DiRisio, CEO of One Smart Cookie Productions, told TDmonthly. It was named a 2009 Dr. Toy Vacation Product of the Year and was a 2009 Gold Award winner in the National Parenting Publications Awards (NAPPA). Launch date: May 2008. IlluStory - Christian Edition by Creations by You, Inc.
Other products from Creations by You, Inc. This kit includes everything a young author needs to write and illustrate an inspirational book. It comes with two cover pages, 18 book pages, 10 washable markers, Internet Production drawing tools, and a story planner that references Christian topics and stories from the Bible. Production of the 7" x 9" hardcover book takes three to four weeks. This product is bilingual (English/Spanish) with a total of 140 activities. All activities are designed with a Web-browser format and user-friendly screen-scrolling function to enhance young users' computer skills. It has built-in, one-touch keys for direct access to main modes with real laptop simulated applications included. It's created to help kids learn grammar, math, drawing, logic, music, translation and personal organization. "[A] unique circular touch panel allows for quick file search," Jackie Tam, senior sales manager for Hanzawa, told TDmonthly. Launch date: October 2009. Do you want to learn a foreign language? It doesn’t matter what age you are. Do you want to start a foreign language program? Are you running an organization and want your employees to learn foreign languages? Do you want to be a language teacher? Inspire your students and fly high with them. Do you want your children to learn a foreign language quickly and easily? Then the Sing2Learn Products and Book is for you! This behavorial modification device is designed to teach children acceptable sleep patterns by displaying a sun face for day and a moon face for night. It can be preset to any times, depending upon the schedule that parents set for their children. The sun caricature brightens the room in the morning, letting kids know it is time to get out of bed; the moon signifies that it is "time to rest." The programmable light measures 6" in diameter. Other products from PARCHMINT, INC. The Purpllinker from Parchmint, Inc. is designed to duplicate the play value of an old-fashioned carpenter’s ruler. The Purpllinker builds on the ruler’s concept making it smaller, stronger, safer, more flexible and adds yet another unique dimension. Seven arms become adjustable when linked together, so the Purpllinker holds its shape to form letters, numbers, and objects. A series of holes on the five inside arms guide the child in learning and playing games. The Purpllinker helps with reading and math readiness for all youngsters, especially those who learn best through hands-on activities. Did you know the constellations are grouped by astronomers into families – like the Hercules, Heavenly Waters and Ursa Major families – whose members are in the same region of the night sky? After playing this game a few times, individuals may be connecting constellations all over the sky. It includes action cards and a galactic die to change the game play up in lots of spacey ways. An awesome constellation pocket guide is included. "Constellation Connect! is an attractively packaged game with a lively blend of fun and educational attributes, making it suitable for home, vacation or classroom use. It introduces the deep beauty of the starry skies to children in a friendly, fun and non-overwhelming way," Geoffrey Moran, president of Evolving Toys, told TDmonthly. 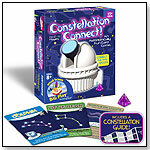 This game received a 2009 Dr. Toy Best Vacation Children’s Product award. Launch date: August 15, 2008. In this fast-paced word game for two to five players, players trade two-sided letter cards between elegant wood racks, to create words, or steal them from each other. It may be used for family game nights as well as in educational settings. Game play takes 30 to 45 minutes. "PatchWord employs a unique game mechanic using cards with different letters on the inside vs. the outside, which trains logic, memory and sequencing skills, as well as spelling and vocabulary skills," Daniel Weaver, founder of Knightweaver Games, told TDmonthly. This product has won the following awards: 2009 Dr. Toy Best Vacation Children's Products; and 2009 Game of the Year for Educational Word Game from Creative Child Magazine. Launch date: January 29, 2009. Designed to combat boring kids' golf lessons, myminigolf employs obstacles the teacher can use to motivate kids in a playful way. "There is no competitor on market. myminigolf is the only product for this application," Hannes Weber, designer for defacto.GmbH, told TDmonthly. This product was a finalist of the "Golf Europe Product Award 2008." 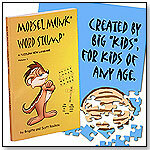 Morsel Munk® Word Stump® is designed to fuse fun, imagination and exercise for the mind. It's where word association, synonyms and antonyms meet crosswords and word searches. "The goal of these puzzles is to challenge and expand the creativity of which everyone is capable. They are not strictly a test of knowledge/book smarts," Brigitte Rouleau, vice president of Morsel Munk LLC, told TDmonthly. Launch date: November 2008. KidsRuler was created by a veteran elementary school teacher, who noticed that students consistently struggled with using the standard ruler to learn the beginning concepts of measurement. KidsRuler was created to help students visualize the increments of measurement, and give them a fun way to practice their skills. The KidsRuler helps students master the NCTM standards of measurement. They also connect together to allow kids to measure real-life objects, such as a desk or chair. — Mention ToyDirectory and receive 10% off on your first order. Goodnight Moon 123 Counting Games by BRIARPATCH INC.
Other products from BRIARPATCH INC. These counting and matching games offer seven versions of play for children at different levels of skill and experience. There's a different game for every night of the week. 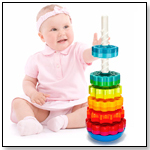 It encourages listening, matching, and beginning number and reading skills. The product features the endearing artwork from the classic book "Goodnight Moon" and is made in the USA. Launch date: March 31, 2009. •TDmonthly Goes Inside ... The Dinosaur Farm, South Pasadena, Calif.
•TDmonthly Goes Inside ... Ventura Toys, Sherman Oaks, Calif.